Yes, I'm aware we've lived here for over two months, and I still haven't posted pictures. Oops. In my defense, I did move and I'm still not totally unpacked. 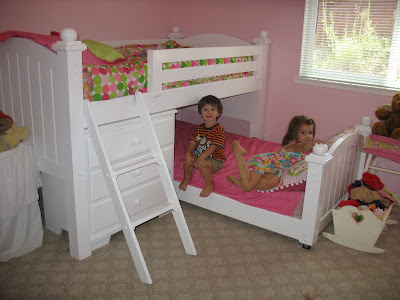 I did however find the camera cord today(now if I could just find the rest of the silverware) so here are a few pics of the kids rooms. 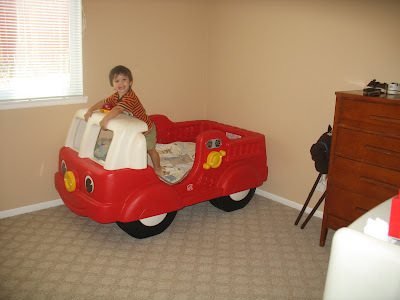 Poor Ant got the smallest room in the house, but I wanted his room next to Amelia's, so thats what he's got. 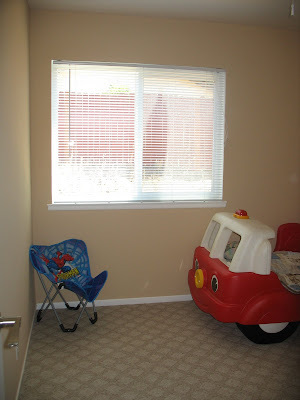 Besides, the office/spare room/ sewing scrapbooking room needs to be large to hold all of our junk. There are no curtains in Ant's room because I haven't figure out what I want in there yet. 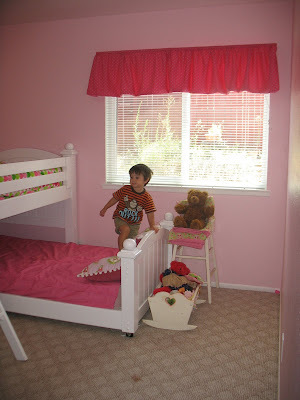 Amelia picked the fabric for her valance herself, which is why it's pink. (Cause the pepto bismal color on the walls isn't enough pink. LOL) So yeah, I'll stop rambling now, here are the pictures. :-) Click to enlarge. I need to post pictures of Izabel room. 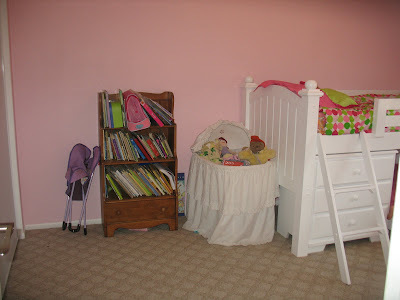 Her walls are pink also but brown trim and brown curtins. Her Furuntiure is brown except her town chest. I need to get a fram for her Bell picture also. Her Aunt Becky painted all her sister Grandkids a picture to hang in there room.